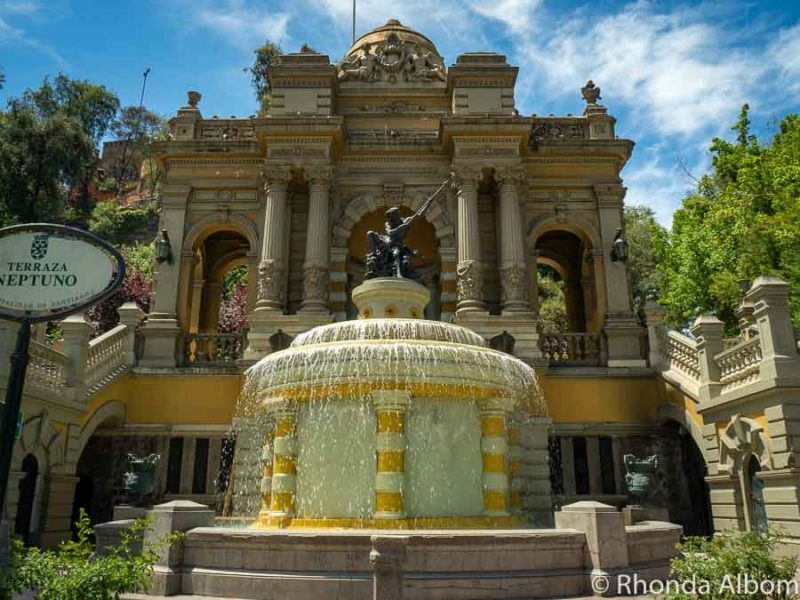 Santiago, the capital of Chile, is an eclectic mix of architectural styles. 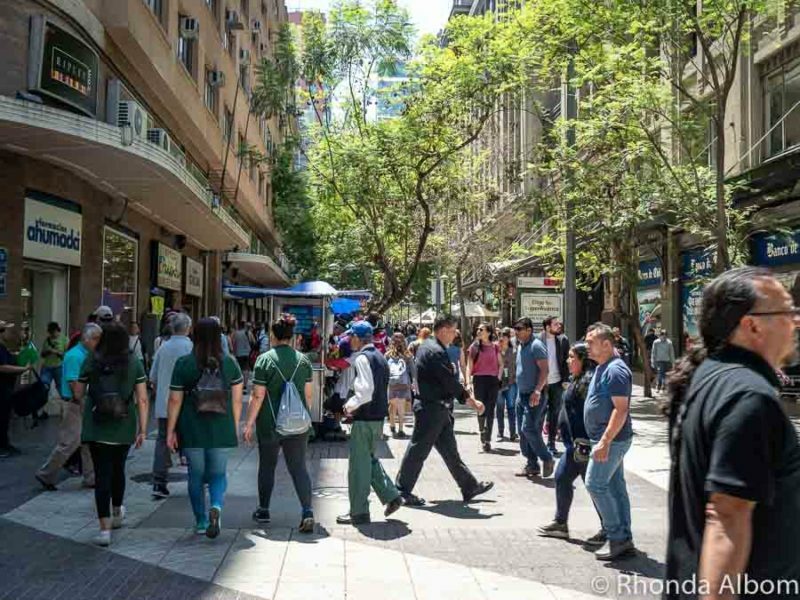 We spent five days in the city and filled our time with a variety of activities as there is an endless list of things to do in Santiago Chile. Below are our highlights and recommendations. We opted to discover the city with the hop-on-hop-off bus from Turistik, selecting the two-day Discover Santiago option. 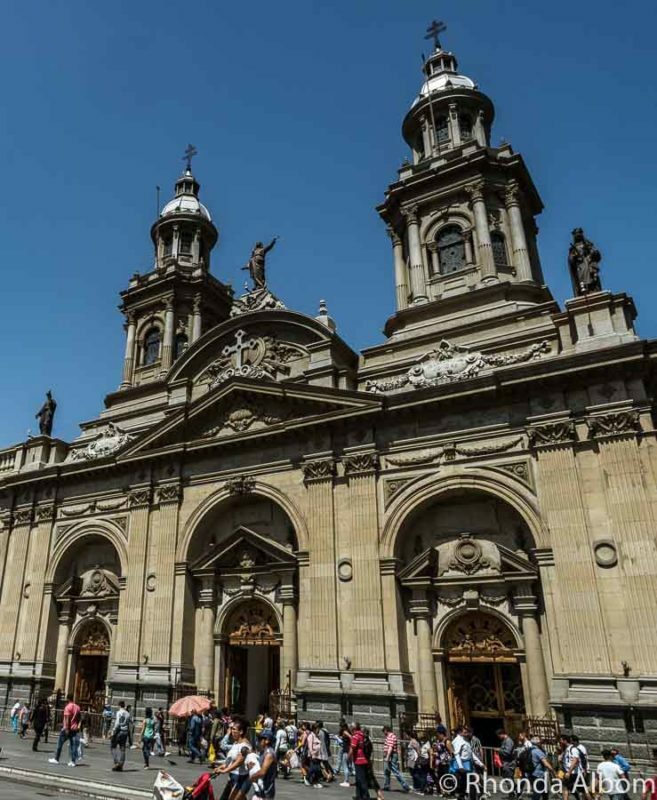 This was a perfect introduction to the city that provided us with transportation, a city tour of Santiago in English, and the flexibility to spend time seeing the sites that interested us. (More on this below.) It’s one of the better hop-on-hop-off bus tours we have taken. 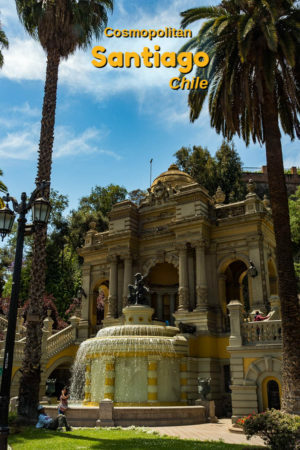 6 Which do you believe are the best things to do in Santiago Chile? Standing tall at 300 metres, Sky Costanera, the tallest building in Latin America, is only 28 metres shorter than the Sky Tower in Auckland New Zealand (the tallest free-standing structure in the Southern Hemisphere). Taking a 50 second elevator ride, we headed up to the observation deck about an hour before sunset. This is definitely one of the best things to do in Santiago. 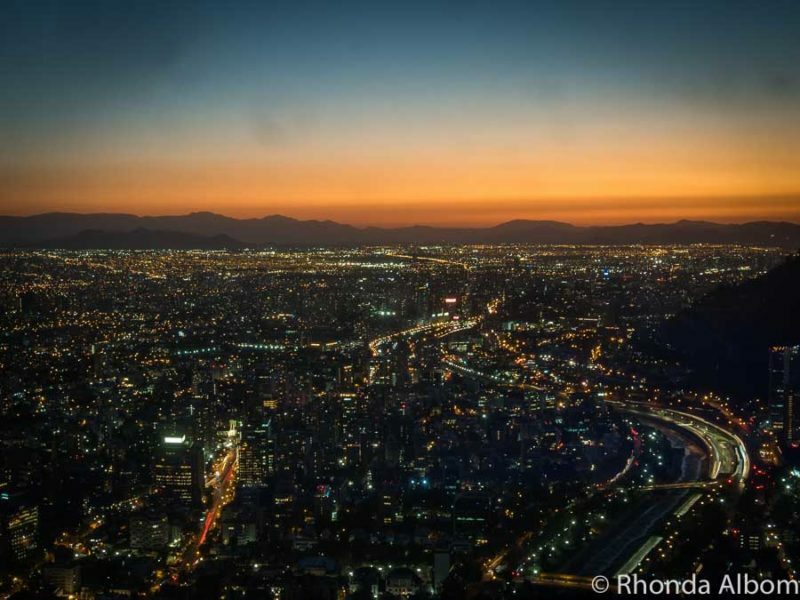 Santiago is a city surrounded by mountains, and the golden-hour glittering views are quite impressive. Alongside both locals and tourists, we watched the sun ball slowly dip below the horizon, an event that was followed by a round of applause from the Chileans. The city lights just after sunset. Costanera Center is stop number 10 on the hop-on-hop-off bus. Photos just don’t do justice to this huge fountain dedicated to Neptune, the Roman god of the sea. Seemingly out of place in the centre of a city, as we entered through the ornate iron gates and walked along the lush path leading up the hill we were transported from the hustle and bustle of the big city. Legend tells us we can make a wish by standing with our backs to the fountain, closing our eyes, and simultaneously making a wish and tossing a coin in the water. San Lucía is a hill with a long history as it was a volcano 15 million years ago. More recently, it was the starting point for the founding of the city of Santiago in 1540 by the Spaniards. San Lucía Hill is stop number 8 on the Santiago hop-on-hop-off bus. Not an original name, there is a Plaza de Armas in just about every Chilean city we visited. 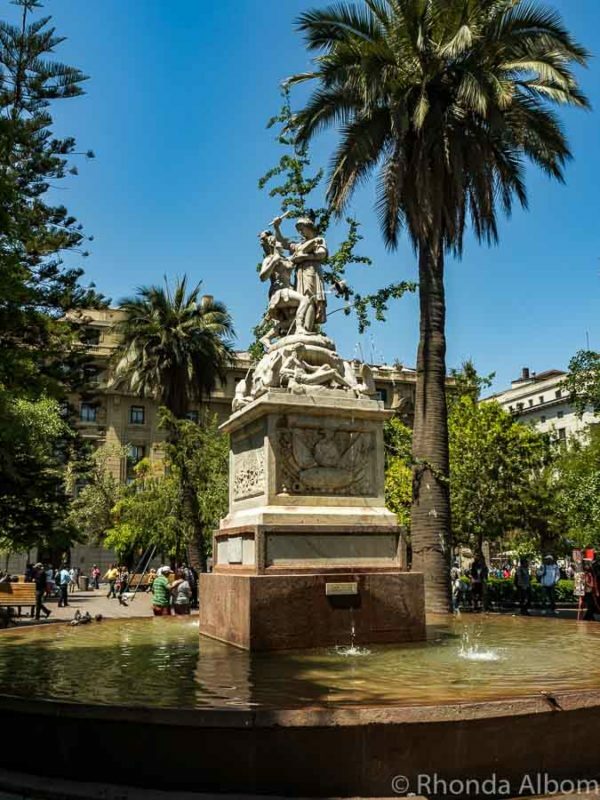 This is because when the Spanish arrived they started their city construction at Plaza de Armas with a cathedral, a Cabildo (government building), and a central park. Today it is still the centre of town life, used for ceremony, and loaded with historic architecture. Fountain in Plaza de Armas in Santiago. Plaza de Armas is stop number 5 on the hop-on-hop-off bus tour. 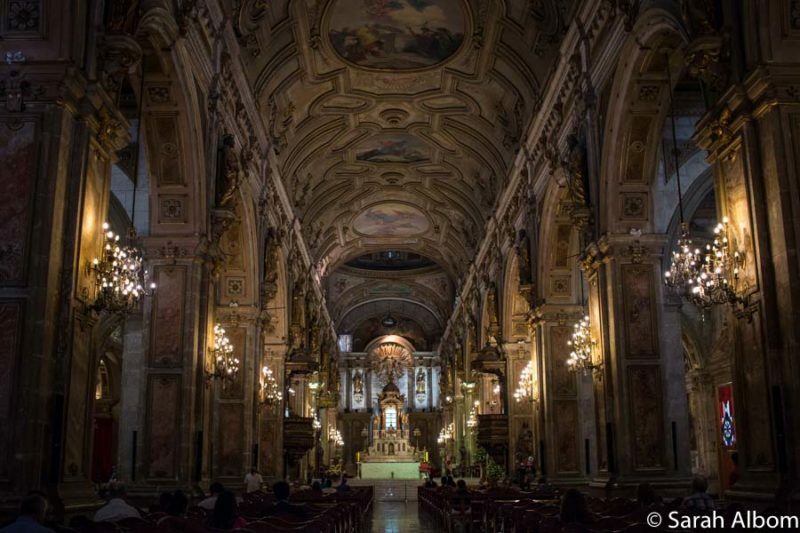 Located on Plaza de Armas, the Metropolitan Cathedral is recognized as one of the main Catholic symbols in Chile. Construction began in 1544, with the final refurbishments in 1899, resulting in a mix of architectural styles that are dominated by Neo-Renaissance. Be sure to enter this impressive cathedral. Interior of the Metropolitan Cathedral in Plaza de Armas, Santiago Chile. 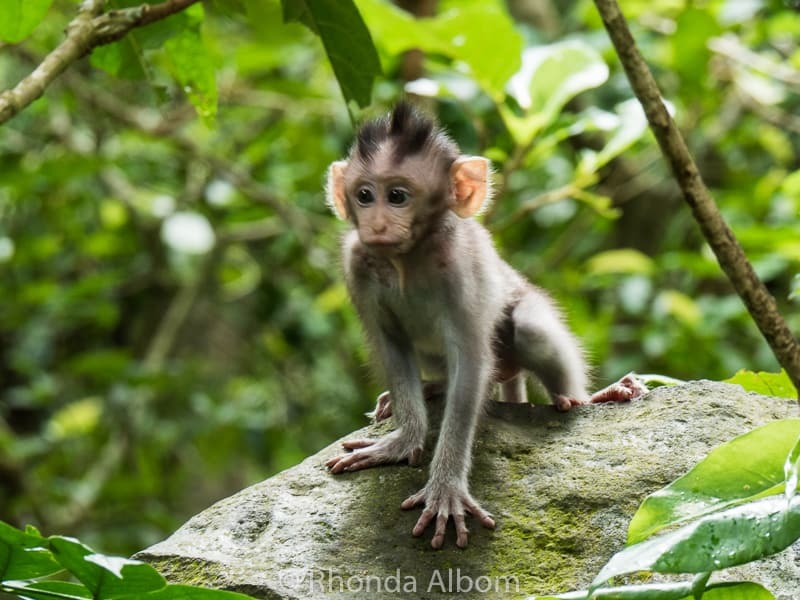 Photo Credit: ©Sarah Albom. Used with Permission. The Pre-Colombian Art Museum is one of the more unusual museums we have visited as we make our way across South America. It features artworks of American indigenous populations predating the 16th century. The neoclassical building that houses the museum is also a masterpiece. Built in the early 1800s as the Royal Customs House, it was destroyed by fire in the last century, and repaired to house the museum. One of the many exhibits at the Pre-Colombian art museum. The man to the right offers size perspective. 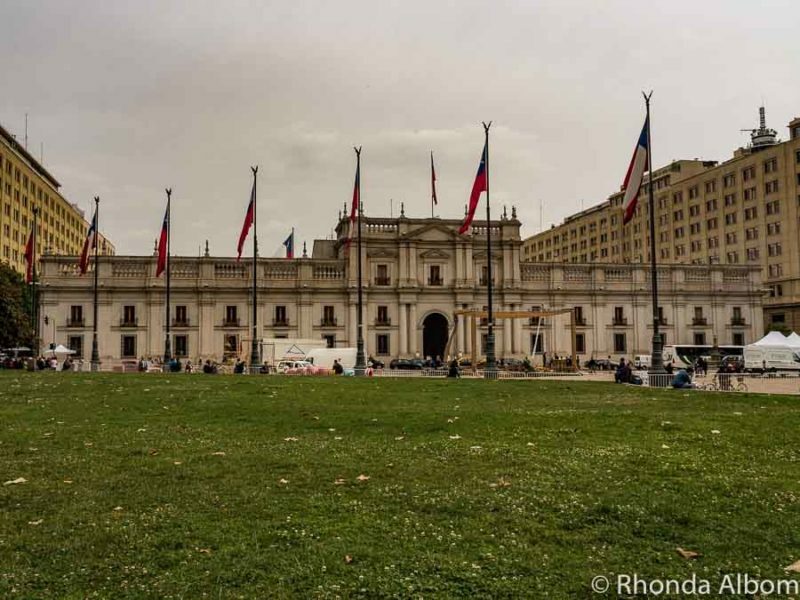 La Moneda Palace is a piece of Chilean history that is now a World Heritage Site. A stunning example of neoclassical architecture, it holds the seat of the President of the Republic of Chile, as well as the offices of three cabinet ministers. La Moneda holds a place in Chile’s history having originally served as a mint, later as home to presidents, then the seat of power. It was damaged on September 11, 1973 when military forces staged a coup, a day that ended with the announcement of the death of the president (a controversial event that has been officially labelled a suicide). Daily tours are available in both Spanish and English but must be booked in advance. The interior is an understated elegance, a striking example of what I believe a top government building should look like. Exterior of La Moneda Palace. Inside the Montt-Varas room of La Moneda Palace. 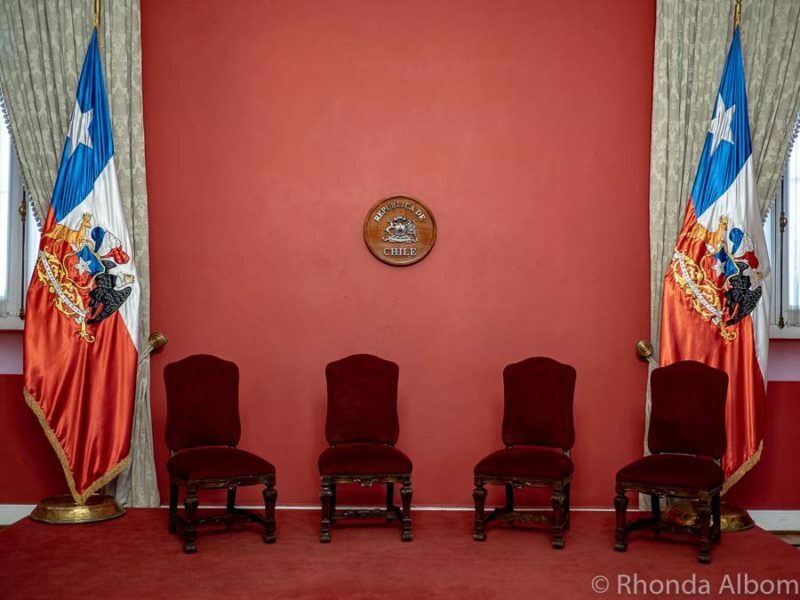 This is where the Chilean president meets other foreign dignitaries. La Moneda is on Constitution Square. 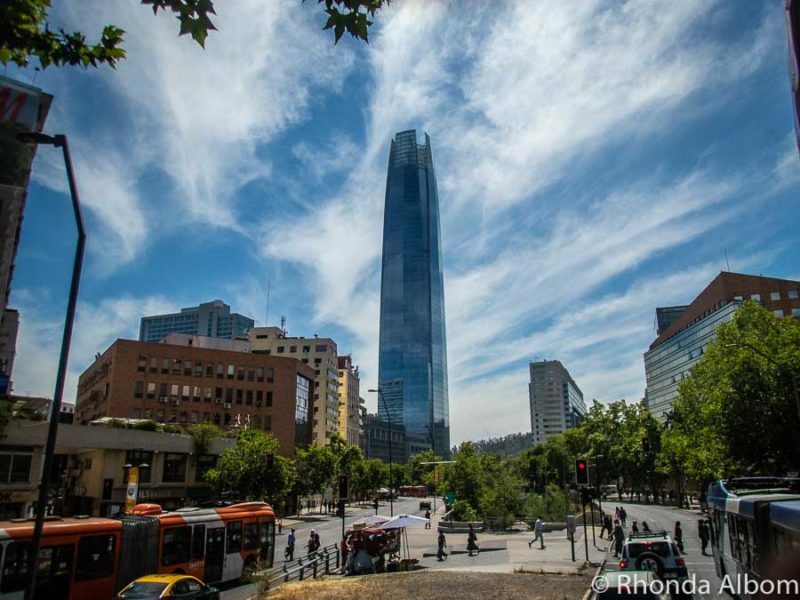 Here you will also find the Palacio de la Moneda Cultural Center and the Santiago Stock Exchange. Constitution Square is stop number 6 on the hop-on-hop-off bus. Bellas Artes is the Chilean National Museum of Fine Arts. Established in 1880, it’s the oldest art museum in South America. For me, it was the building itself that made the visit worthwhile, in addition to the over 3,000 works in the museum. 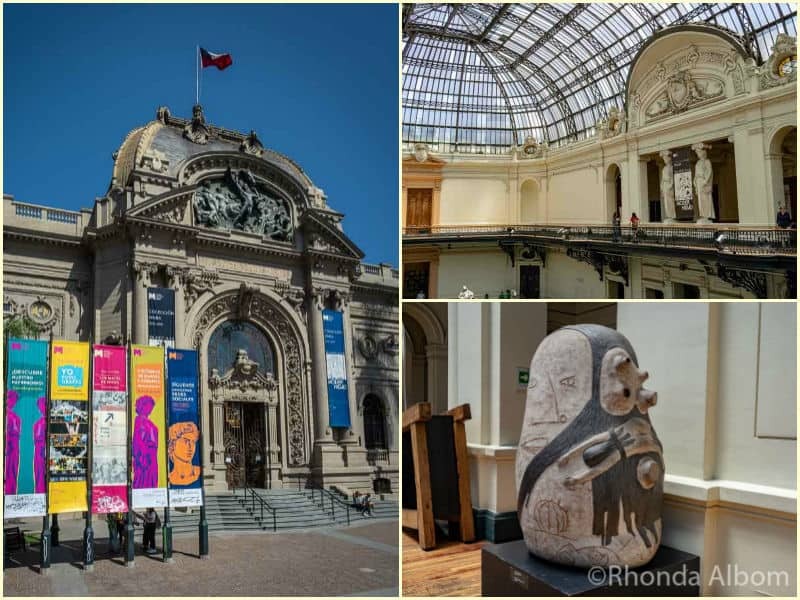 Bellas Artes – The National Fine Arts Museum of Chile. San Cristobal Hill peaks at 860 metres (2821 feet) above sea level. 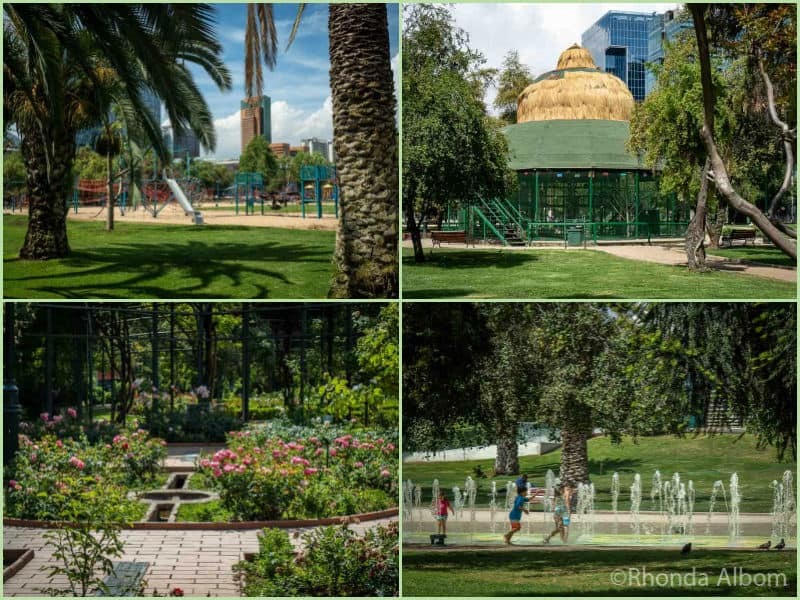 It is a part of Metropolitan Park, Chile’s largest urban park. Note: While the funicular is open daily, the cable car is closed on Mondays. If you purchased the Hop-on Hop-off Plus (two-day pass), both rides are included and you will want to start from stop number 2 on a Tuesday to Sunday. A panoramic view on a foggy day from San Cristobal Hill. 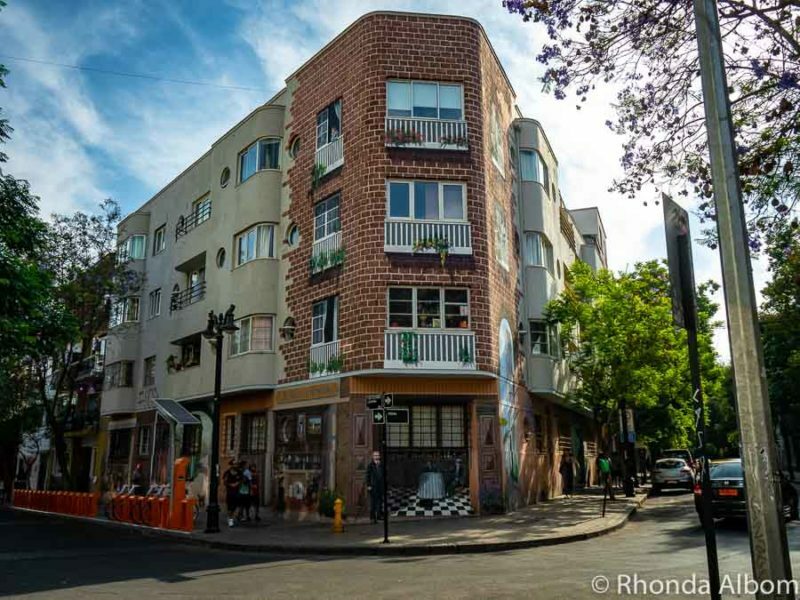 The popular bohemian Lastarría neighbourhood is both a local and tourist hang out. Whether it’s cultural activities, festivals, restaurants, or the nightlife, there seems to be something for everyone to enjoy. We were directed here more than once, the first time when we were seeking a reserve wine for a gift, and the second time to eat at Wonderland Cafe. 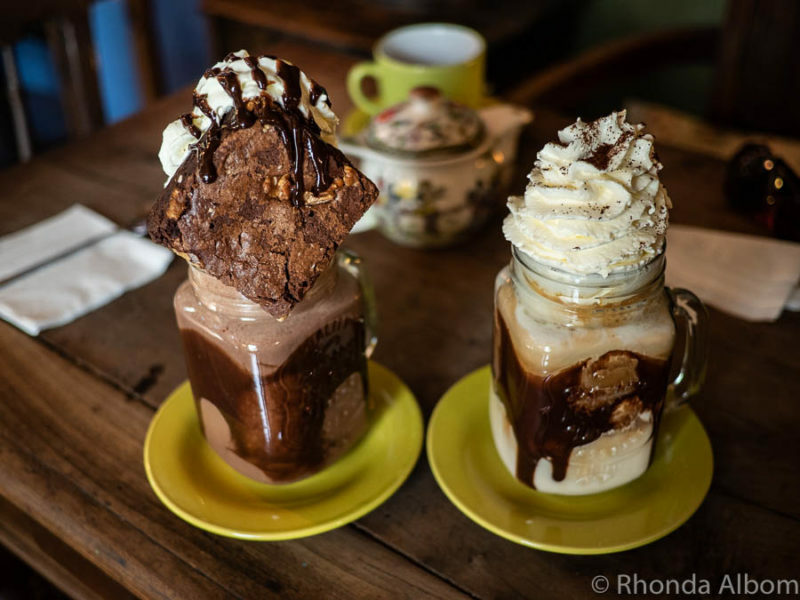 Designed with Lewis Carroll’s book in mind, this place features “drink me” treats that are massive in size. I had a “Madhatter”. The Madhatter (has a brownie) next to Jeff’s Cafe helado (ice cream and coffee). The lush green 22 hectares of Araucano Park is the ideal spot to relax. At Araucano Park we found a gentle walking path that leads to a bird aviary, a rose garden, a playground, and the kind of fountain children can’t resist running through. It’s at hop-on-hop-off bus stop number 13. While there are plenty of interesting and fun things to do in Santiago itself, the surrounding area is also filled with treasures. We spent three nights in the Viña del Mar and Valparaiso area (where we took a cooking class and enjoyed some of the world’s best street art), but many people visit both cities on a day trip. 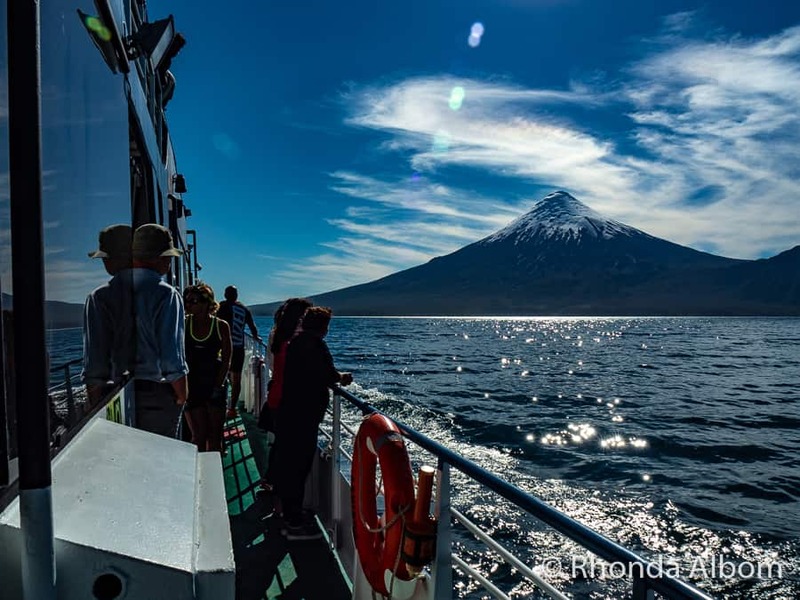 Other popular excursions include winery tours, Andes mountain hikes, and a visit to the home of Chile’s Nobel award-winning poet, Pablo Neruda. I will admit, shopping is not on my things to do in Santiago list, which is why it is last on this list. However, if I were a shopper it would be. At the base of Sky Costanera is a five-story modern shopping mall (Costanera Center) that we had to walk through to get to the tower’s entrance. While it looks complete, with everything one could imagine, it is the Parque Arauco Mall that earned spot number 1 on the Turistik Santiago Hop-on Hop-off bus. Pedestrian-only shopping streets near Plaza de Armas. If you are looking for something special to purchase, consider Lapislázuil, a semi-precious blue stone that is found only in Chile and Afghanistan. On a personal note, for us, the real highlight of our time in Santiago was catching up with our former exchange student and meeting her delightful family. 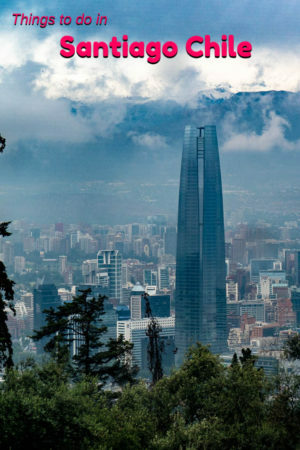 Like most major cities around the world, there are plenty of Santiago accommodation options. Despite the vast number of choices, we think we found the best choice on our second visit to the city. 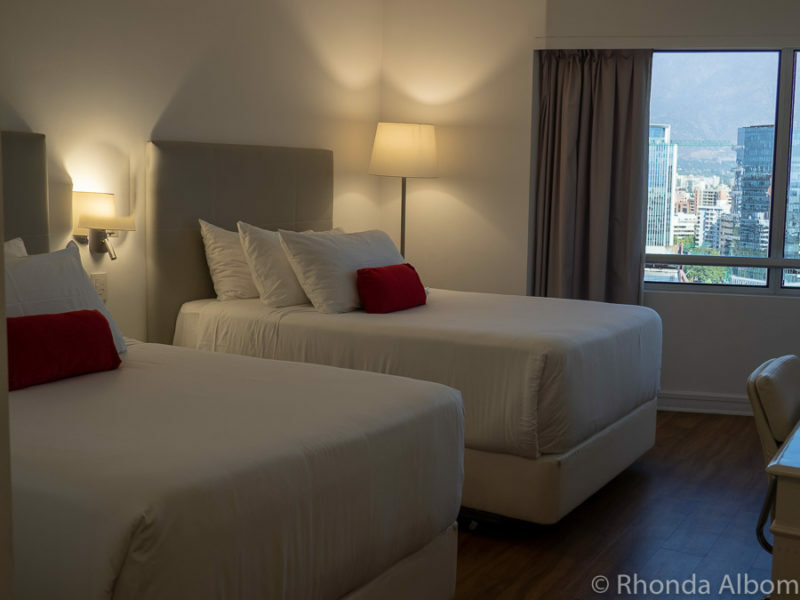 We slept in luxurious beds and woke to a delicious breakfast at the NH Collections Santiago Plaza. If that wasn’t enough, we had a high floor room with fabulous views of the city, and the hotel is across the street from Costanera Center. We were close to great restaurants and near a metro station. Of course, everything was immaculate, we had all the amenities we could want, and they could arrange for anything we needed. Our room at the NH Collections Hotel in Santiago Chile. If you’re not a fan of five-star luxury, or just prefer to spend a little less on accommodations, these are the recommendations from a local friend. The Turistik hop-on-hop-off bus tour is how we got around the first two days. It’s a perfect introduction to the city, and an easy way to tour. We took the two-day option, giving us enough time to see it all including the cable car up and the funicular down San Cristobal Hill. Best of all, the buses run every 30 minutes, we can get on and off the bus as many times as we choose, and we can go around as many times as our day will allow. As the bus drove around the city, we listened to audio commentary through provided headsets (available in multiple languages including Spanish and English). NOTE: At first we found it difficult to find the bus stops as they are not well signposted, However, the addresses of the stops are printed in the guide provided when you get your ticket. Santiago has both taxis with metres and Remis where the price is negotiated in advance. If we needed to flag down a car, we always took metred taxis. However, from the airport, Remis is a good option as it has a fixed price regardless of traffic. We found the public transportation to be surprisingly clean, on-time, and easy to use. A BIP card is needed to use the buses or metro. Purchase a card and add money to it at any metro station or Bip Center (Centros bip!). You can use one card for the entire family. You will need to use the card to get onto the buses or into the metro station. However, the payments are based on time of travel (pay more at peak times), rather than distance, so the card is not needed to exit. If you plan on driving while in Chile, we had great success with RentalCars.com. They found us the best prices, offered us options of companies to work with, and of cars. Everything went smooth as silk for the rental of our vehicles. (However, I strongly caution against using Europcar in Chile, as we used them in the Atacama desert and they deducted from our deposit an amount greater than the cost of the rental for two new shock absorbers, although only one was shot). Mixed with public transit, hop-on-hop-off bus, or taxis, Santiago is an easy city to walk around. The currency is the Chilean Peso (CLP). Typically only CLP or credit cards are accepted in restaurants, shops, and for entrance fees. Most museums in Santiago are closed on Mondays. It is customary to tip 10% in restaurants, and this amount is often added to your bill, labelled “propina.” If paying with credit, the server will often ask if you want the tip included, the assumption being that you will otherwise tip it in cash. While you can drink the tap water, it is not provided for free in restaurants. Neighbourhood safety is varied; therefore, you should check with your hotel before going out at night. Click here for more South America safety tips. If you are getting a taxi, and are not fluent enough in Spanish to negotiate your price, select one with a meter. If you drive, we recommend Maps.me. We found it to be more accurate than Google Maps in Chile (and Argentina), and Maps.me offers downloadable maps that work offline. Tours of La Moneda must be booked in advance, and in peak season can be booked out for weeks. Check their official website here. 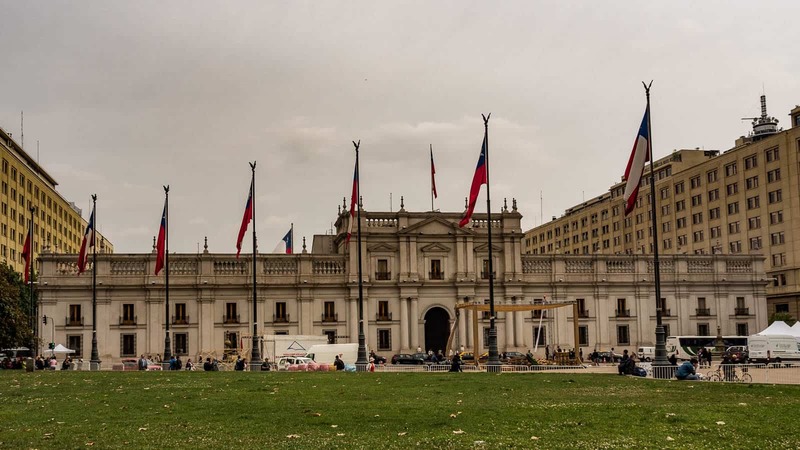 If you are visiting Santiago for multiple days, book the La Moneda tour for your first day as any presidential activity will change the dates to a future date. Our tour moved one day forward. 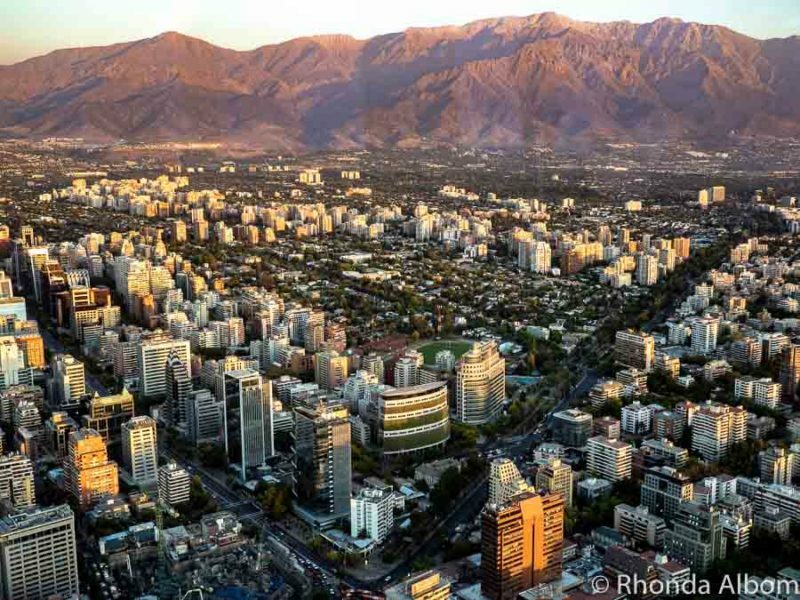 Which do you believe are the best things to do in Santiago Chile? Disclaimer: While you pay the same, we receive a small commission from many of the links of this page. It helps us pay for this page. In addition, we were media guests of Turistik and Sky Costanera. We are frequently provided with complimentary entrances, tours, accommodations, or sample items in order to gather information necessary to write our reviews. However, the opinions expressed here are strictly our own. So cool! My best friend was born in Chile. I dream of visiting with her as my local guide someday. Thanks for sharing! I will admit that I don’t know much about Santiago despite my niece-in-law studying there at university a few years back. I enjoyed your photos while learning something about a city that doesn’t get much notice here in the US. Chilean skies always look so beautiful!! I wish i had seen this post a week or so ago. There were cheap deals being offered from DFW to Santiago, but I just didn’t know anything about the area, except for the beautiful skies so I couldn’t convince my husband to pull the trigger on the fare. 😉 Definitely saving for later though! Interesting that you had a bad experience with Europcar. We have rented cars all around the world over three decades of frequent travelling and Europcar stands out for bad experiences. We only rent from them if there is no other choice. All of the vistas you list look amazing, particularly San Cristobal hill. I’ve loved reading about Santiago from other travel bloggers too, like Lauren and Marcella. So it would be amazing to visit and finally see it in person! You are lucky you did!! 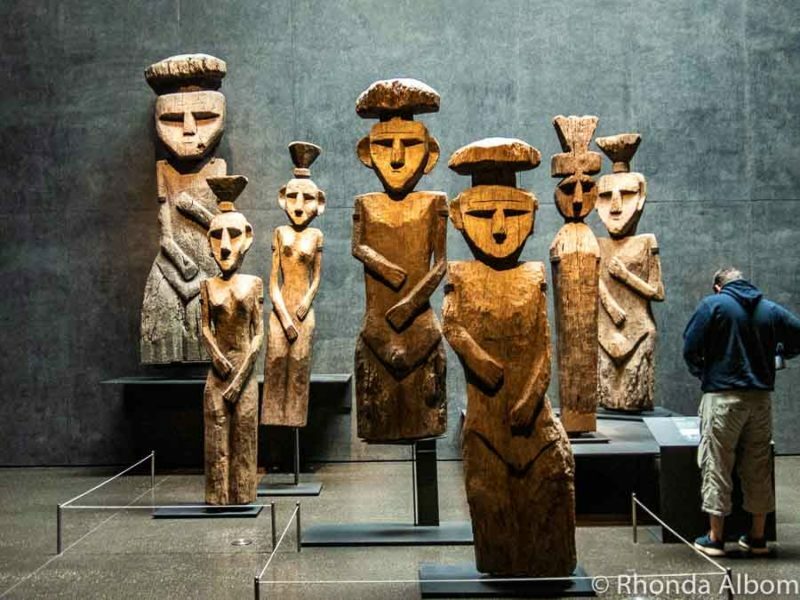 Oh, I’d really like to visit that museum of pre Columbian art! Your photo of the sunset gives a clear idea of how this city is nestled up against mountains. So beautiful! I would love to ride the funicular up Cristobal Hill, too! I would love to visit sometime. Thank you so much for sharing! What a find! I had no idea that Santiago has so much to offer. Gorgeous photos! And those views from the top of the San Cristobal Hill and from the Sky Costanera are really spectacular. Very inspiring post! Santiago looks like a total dream! I’d so love to visit Chile someday. We have a chinchilla and Chile is where they’re from – we dream about seeing one in the wild there! Amazing photos – that brick building totally tricked me!! Interesting pictures! I’m not sure I’ve ever seen pictures from Santiago before. What a beautiful and fascinating city, I love everything about it – the sights, the sounds, the culture, everything! Your pictures are just beautiful and you captured your trip wonderfully. Thanks to you this city is now on my travel bucket list – Thank you for allowing me to experience this vibrant city from your eyes! You will love it when you get here. There is so much to do and the architecture is so eclectic and beautiful. Oh, take me to that cafe now! The sky in the top photo is super charged like it’s moving toward an unearthly event. Your photos are so imaginative and professional. The trim is painted on? 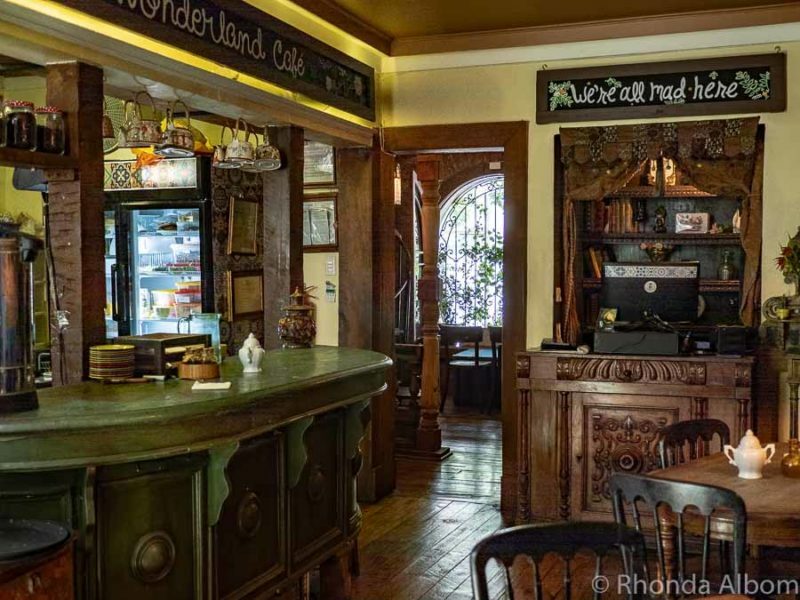 Wonderland Cafe is amazing, but go hungry, really hungry. The “drink me” meals are huge. And as for the trim on the building, look closely, only the windows in the front are real. I hear it is a wonderful city to visit and it looks like you had an awesome trip! Thanks for sharing your wonderful experiences! Yes, we loved our time in Santiago. It’s really quite beautiful. I’ve never really thought about it. Santiago surprised me a bit too. Loved seeing the Santiago pictures! My DIL is from Santiago, so we have been there several times and I am always ready to go back. One of the sites I enjoyed when we were there was the Pablo Neruda house. A nice day trip is to visit wine country outside the city. How fun! What a great city to go back to often. What a great guide! I would love to visit Chile one day. Thank you for the suggestions. I hope you get a chance to explore all of Chile. It’s a lovely country filled with such diverse landscapes. Marvellous photos! Thank you so very much for sharing the tips. Thanks. Santiago is an easy to city to photograph, so filled with lovely spots. Thanks Hilary, and yes it was the variety of different things to do in Santiago that kept it so interesting. Yes, the clouds were fascinating. I didn’t know how beautiful Santiago, Chile was. I am adding this to my list of places to go to. Neither did I. It’s a city that caught me off guard. It looks like it’s time to return. The last time I was there was during the revolution- and I hightailed it out. And, I love when cities offer tourists that on-off bus. I was disappointed when Jerusalem discontinued theirs. That was quite a while ago. I wasn’t there then, but from what people tell me it’s very different now. It’s happier. Yes, the hop-on hop-off tour was pretty impressive, loaded with history and interesting stories. If I remember correctly, Westminster is much larger. 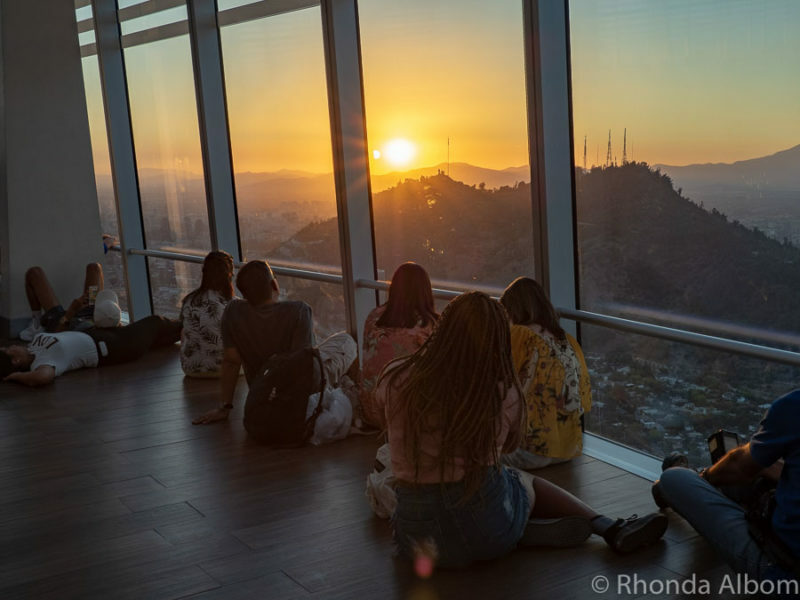 I love the idea of watching the sun go down from a sky scraper, I would have never thought about that, it looks beautiful from the photos! And that cafe you visited, oh my goodness that brownie treat looks SO yummy! Yes, that brownie embedded into a milkshake was so big, I couldn’t finish it, despite it being so awesome. I love the cafe. It looks so cozy. The mountains around Chile look just like those in New Mexico. I don’t remember the mountains in New Mexico. We went to two art museums, the classic fine arts museum and the pre-Colombian one. I think my favourite was the second one, but mostly because it is so unusual. The Sky Costanera sounds awesome Rhonda. I did not take the trip up but saw the tower in Auckland last year. Super impressed. It’s the mountains surrounding Santiago that make it so special and beautiful from up above. The architecture is quite beautiful. And what a huge city! Yes, I have so many amazing photos, it was difficult to choose which ones to put here. Hello, what a wonderful post. A tour of Santiago Chile looks fantastic. I enjoyed the photos and all the great tips of what to see. Thanks for sharing. Enjoy your day and have a great new week ahead!